All of the hardware you need to complete one Townsend Travel Bag ( Item LST118 ) will be included. Kits are available in silver, gold, antique, gunmetal black, and copper finish. 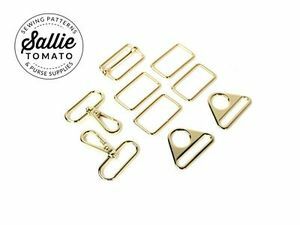 Included Hardware: (4) 1 1/2in Rectangle Rings, (2) 1 1/2in Swivel Hooks, (2) 1-1/2in Triangle Rings, and (1) 1-1/2in Slider Buckle.